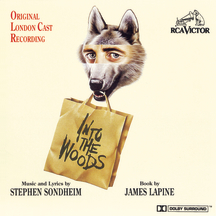 Transplanted to the London stage, where it opened at the Phoenix Theatre on September 25, 1990, Into The Woods received the same kind of accolades it had enjoyed in New York upon its creation. With a cast that included Julia McKenzie as the Witch, Clive Carter in a dual role as the Wolf and Cinderella’s Prince, and Imelda Staunton as the Baker’s Wife, the James Lapine-Stephen Sondheim musical added one new number, “Our Little World,” for the Witch and Rapunzel. It closed February 23, 1991, after playing 197 performances.